it's friday night. you and your husband have decided to order a pizza and watch movies (or binge watch a tv show... because let's be honest, that's what happens in our house). the question suddenly turns to what kind of pizza to order. you want something simple like pepperoni, but he wants it fully loaded. you could order 1/2 pepperoni and 1/2 fully loaded... but then his olives, mushrooms, and everything else you don't like spills over onto your half. suddenly your half ends up as 1/3 and you're left picking out olives from the rest. however, most grocery stores carry lactose free cheese (i use Cabot brand), so making pizza at home is an easy option! we're going for quick + easy though, so we don't attempt making our own pizza dough that has to rise. 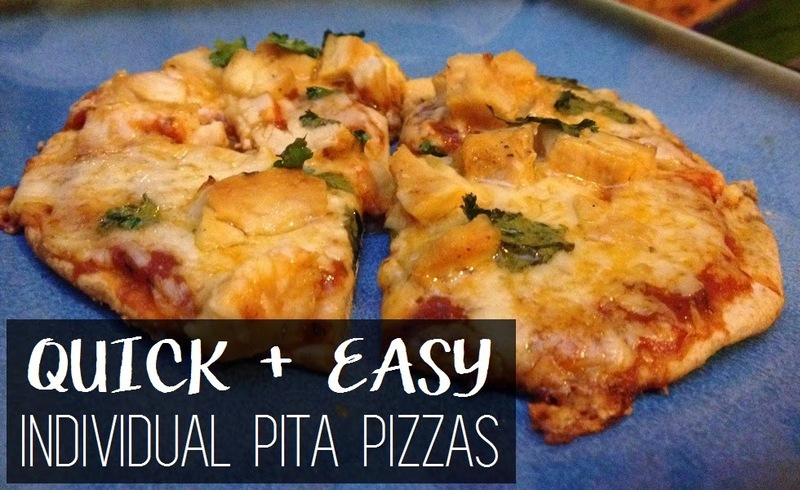 i am not a fan of the already made pizza crusts, so we use pita loafs and they work great! plus, they are the perfect size for an individual pizza! this way, we can both get the exact pizza we want without having to pick off any unwanted ingredients! any pizza toppings you want! Thomas loaded his up with chicken, ranch, buffalo sauce, olives, & cilantro. do you make your own pizza at home? what toppings are on your pizza? I make pita pizzas for lunch all the time! We are fans of ham and cheese, primarily because I almost always have those items in the house. We haven't made them in a while, so I'll have to make a point of adding them to the menu soon! I need to do these more often... so yummy.. & easy & healthier then the alternative! ah neat!!! whenever i first saw the idea of making pizza out of pita loaves i just thought it was genius & couldn't believe i had never thought of it before! so simple & delicious! yum we do this all the time and yup, we binge watch Netflixs :) Have you ever tried Daiya cheese? I love it and it's lactose/vegan and melts. Although I guess you can easily get real cheese without lactose right? haha awesome! :) i have not tried Daiya yet... i just may need to!! Yum! I feel you on the pickiness part; you sound just like me! Before my husband went on a "make my own bread and pizza crust" binge we would often buy Stonefire's naan bread (found in the bakery section of our grocery store) and use those. We recently boiled and shredded chicken, mixed in a bunch of great barbeque sauce in, then used that with BBQ and mozzarella and cilantro for a really good BBQ chicken pizza! i use pita to make little pizzas ALL THE TIME. but i use hummus as my base and load that sucker with veggies! i became lactose intolerant in my 20s, too!! so rough. i just tried soy milk for the first time ever this week (despite the fact i've been lactose-intolerant for over a year now), and it's just not that good. idk. any suggestions? i still love milk and want the calcium! also, THIS LOOKS SO GOOD! we're all about using whole wheat tortillas (or iiii am, let's be real), but a pita?! yasss! naan bread is a good idea too! i love that they are so many options to customize your own little pizza! :) and that BBQ pizza sounds amazing!!! i just may need to try that! ahhh crazy! welcome to the lactard club haha! oh i am with you... i hate soy milk!!! soy can actually be hard for your body to process too... so i use almond milk for everything - Silk brand makes it and you can find it in every store. my MIL uses rice milk and likes it too but i've never tried that. i don't drink milk by itself though... i always drink it in tea or cereal or something. but almond milk has a nice flavor... it's nutty but not too nutty & it's sweeter than normal milk (at least sweeter than skim milk that i used when i was a kid) - almond milk seems to be a lot of people's favorite so give that one a try :) they have unsweetened, original, vanilla, and chocolate even! I've never thought to use pita! So happy you posted this! right?! girl they are so good! when i first saw this idea... i was like "man that is genius! how have i never thought of this before?!"